Let your little one be Fast & Furious around the house with this Kids Electric Motorcycle Ride On Toy! With a rechargeable six volt battery, this electric ride on toy gets revved up at a manageable 3km/hour for your little racer. Ideal for active kids from the ages of two to five, this kids ride on toy encourages imagination, engagement and independence while enhancing coordination and motor skills. 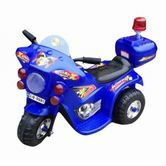 Perfect for indoors or out, this motorcycle ride on is the perfect toy for your little easy rider! We bought one of these for our little 2 and a half year old grandson and he absolutely loves racing around the house on itBut that asian pop music that plays when a button is pushed gives me a brain pain My husband initially disconnected the wire so the asian music didnt play- but at a later date connected it again so our grandson could enjoy the siren sound at least unfortunately all of the sounds are wired up in the same connection not individually when the loud asian pop music started playing our grandson was so upset he had a tantrum- right there and then my husband had to disconnect all of the sounds in the end. Over all I think the bike was a good buy- our grandson loves it It was very well priced oh and by the way the battery charge life lasts for a reasonably long time too. This was a wonderful present for me grandson even though it still a little big he still has a great time with it.